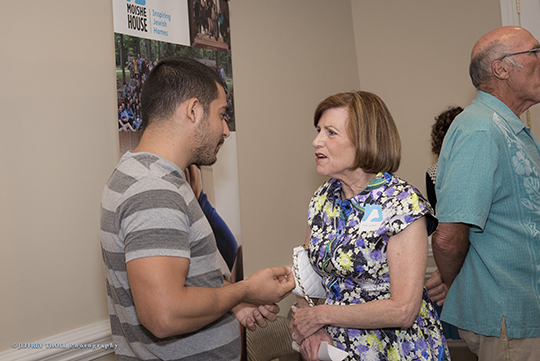 Moishe House’s newest home in Florida for post-college adults to build a community rooted in Jewish values hosted a special reception and ceremony for nearly 60 young adults and community leaders on Sunday, July 16, when its residents affixed a mezuzah to the house’s doorpost. Thanks to generous support from local philanthropists Michael and Andrea Leven, and programmatic support and funding from our Federation, the new Delray Beach location is home to three dynamic young men – Daniel Kay, 27, Chaim Romano, 28, and Benjamin Scheiner, 26. In addition to their full-time jobs, they are creating Jewish life opportunities by hosting weekly programs for hundreds of Jewish adults in their 20s. Keep up with YAD at facebook.com/YoungAdultDivision, or contact Liana Konhauzer at lianak@bocafed.org or 561.852.5015. Learn more about Moishe House at moishehouse.org.